The blogosphere has been atwitter over the latest supposed defection of a climate scientist to the dark side. Once again, the contrarians have been egged on by a well-timed fabrication from Marc Morano of Climate Depot, the anti-science propaganda arm of CFACT (Committee for a Constructive Tomorrow). And once again, Canadian columnist Lorne Gunter has led the charge of the lightweight brigade, with yet another error-ridden and cretinous diatribe against climate science. Even well-meaning and thoughtful commentators and reporters have misinterpreted the recent comments and work of Mojib Latif, the Kiel University climate scientist whose remarks at a session on prediction at the World Climate Conference in Geneva set off the latest furor. Somehow those writers have managed to overlook the fact that Latif, despite projecting less near-term warming than most climate modellers, is still looking for warming close to 0.2 deg. C in the coming decade. But those gaffes are nothing compared to the horrendous distortions of the initial confused accounts now circulating throughout the contrarian echo chamber, where literally hundreds of websites and blogs have echoed Morano’s and Gunter’s gross misrepresentations. It’s high time to correct the record, which I will endeavour to do with the kind assistance of Mojib Latif himself, who has been most generous in answering my queries (our complete exchange can be found here). Sept. 4: One of the world’s top climate modellers said Thursday we could be about to enter one or even two decades during which temperatures cool. – Fred Pearce, New Scientist. Sept. 19: Latif conceded … that we are likely entering “one or even two decades during which temperatures cool.” – Lorne Gunter, Calgary Herald. Sept. 25: Mojib Latif of Kiel University in Germany told a UN conference earlier this month that he is now predicting global cooling for several decades. – Marc Morano, Climate Depot (CFACT). The first step in this sorry story, of course, was the misunderstanding of Latif’s remarks by Fred Pearce, in the New Scientist article entitled “World’s climate could cool first, warm later”. As explained in the careful dissection of Latif’s original remarks at the ThingsBreak blog, Latif’s hypothetical cautionary situation was misinterpreted as an actual prediction, concerning the coming decade. However we all know there is variability, and this variability may look like this. This has been actually derived from the 20th century by just removing some exponential fit… And then the real evolution of, say, globally averaged temperature would look like this. And then you see right away [that] it may well happen that you enter a decade or maybe even two, when the temperature cools relative to the present level. In fact, the actual projection discussed much later in the same session by Latif does not even call for cooling in the coming decade as a whole, but rather estimates 0.18C warming relative to the last decade. (I have more on this below, but the impatient among you can have an advance peek at this figure summarizing Keenlyside et al 2008 projections on which co-author Latif based his discussion). Marc Morano was only too happy to add to the the confusion, as only Morano can, and actually claimed with a straight face that Latif had said world “is about to enter ‘one maybe 2 decades where temps cool'” [sic]. Not “could” or “might” or even “likely” – just a bald, flatout assertion. More recently, that lie (what other word is there?) was expanded to have Latif “predicting global cooling for several decades”. Apparently, the coming period of cooling is growing faster than Pinnochio’s nose. Things really careened out of control once Lorne Gunter got hold of the story. Gunter, who can’t seem to write a single paragraph on climate science without getting something wrong (for instance here, here and here), goes through an elaborate teasing setup. Latif’s change of heart, Gunter explains, is like the Pope deciding that priests should be allowed to marry after all, or, even less likely, that “rock-em-sock-em” hockey analyst Don Cherry has all of a sudden taken a liking to European style hockey (hey, this is Canada). One of the world’s top climate modellers said Thursday we could be about to enter one or even two decades during which temperatures cool. So where Pearce had “could be about to enter”, Gunter has “likely entering”, transforming a possibility, hypothetical at that, into likelihood. And somehow Pearce’s paraphrase has become the exact words out of Latif’s mouth in Gunter’s version. But as Latif pointed out, the Atlantic, and particularly the North Atlantic, has been cooling instead. And it looks set to continue a cooling phase for 10 to 20 more years. …. Latif says he expects warming to resume in 2020 or 2030. Breaking with climate-change orthodoxy, he said NAO [North Atlantic Oscillation] cycles were probably responsible for some of the strong global warming seen in the past three decades. “But how much? The jury is still out,” he told the conference. The NAO is now moving into a colder phase. So Gunter claims that Latif projects Atlantic cooling for another 10 to 20 years, another apparent fabrication, and that warming might only resume in 2030. But in fact, Latif only projects moderated warming up to 2015. And the Latif quote in New Scientist was actually about possible attribution of past warming, not future cooling! Latif did say in his presentation that the North Atlantic Oscillation, and therefore North Atlantic sea temperatures, could be predicted with “significant skill out to ten, maybe even twenty years.” But he presented no actual prediction of Atlantic cooling for up to twenty years. (Once again, New Scientist’s Pearce is closer, but not quite there: according to Latif the “jury is out” on the “relative contribution” of “internal variability” in general). As I mentioned above, I decided to analyze the Keenlyside et al 2008 projections presented by Latif (Nature abstract here), since there has been so much misinformation on the subject. At the same time, I entered into correspondence with Latif, who kindly has given me permission to publish our exchange (see the companion post). Here is the key figure from that study, marked up to highlight the projections for each of the decades 2000-10, 2010-20, and 2020-30. The chart features a forecast curve based on interpolation between particular decadal projections. Each decade is centred on the corresponding year, so that the projection at 2015, corresponds to the decade 2010-2020, for example. Somewhat confusingly, that also means that the decadal projections are overlapping (e.g. 2010 is for 2005-2015). As can be seen by the chart above, a flat period is projected to about 2015, but in subsequent decades strong global warming resumes (the figure is interpolated between decades centred at 2010 and 2020, and thus no precise time of resumption is given). Of course, this chart clearly shows that the moderate warming projected for the past decade has been surpassed by a long shot, and a brief cooling period in 1995-2004 did not happen either. These observations were made at RealClimate.org at the time the study was released; the same commentary noted that the projection also seem to suffer from oscillations due to “coupling shock”. 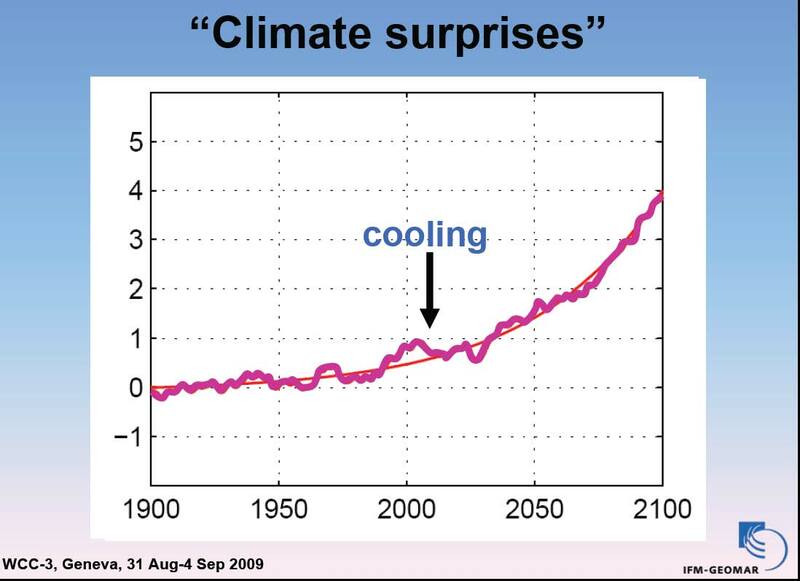 But for our purposes the coming two decades are just as important; in contrast with Gunter’s characterization of “likely” cooling over the next decade “or even two”, Keenlyside and Latif project 0.18C in the coming decade, and 0.35C in the one after that! Gunter could not have gotten it more wrong. For greater clarity, I have plotted the projections, but this time without overlapping decades, including a hindcast for the 1990s. And I have also put in HadCRU decadal observations for the past two decades, leaving off a half-year for the current decade. What I said is that the cooling in the Atlantic and Pacific may offset global warming for a decade so that there may be not much of an additional warming. … I also pointed out that the British group issued a competing forecast for the next decade. They predict that global warming will continue at the rate of the last decades. Thus there is quite some uncertainty about the short-term evolution. Yet we all agree that in the long run, say by 2050 and thereafter, the earth will considerably warm, if we do not considerably reduce global greenhouse gas emissions. This is all correct. However, our forecast more than one decade ahead does not have much skill, as we know from hindcasts (retropsective forecasts). I think what is important to convey is that there are short-term fluctuations which are superimposed on the long-term warming trend. We showed the graph more than a decade ahead to see how long the effect of the initial conditions lasts. It is a forecast, but as I pointed out, we do not have much skill at longer lead times. It may well be that the warming will be even stronger. And, of course, it must be emphasized that this view of reduced warming for the next few years is far from accepted among the majority of climate modelers, as Latif himself has always acknowledged. So far, observations seem to show considerably more warming than projected by Keenlyside and Latif. So where does that leave us? A week ago I left a comment at the Calgary Herald requesting corrections of the most egregious errors, although now that I’ve had a chance to examine and document all of Gunter’s falsehoods, it seems that a complete retraction would be appropriate in this case. However, Gunter usually writes for the Herald’s sister newspapers the Edmonton Journal and the National Post (all part of the CanWest Global media chain). In the past the Journal has corrected Gunter’s factual mistakes, albeit very slowly, while the Post has refused to do so. Will the Herald, like the Journal, do the right thing? Or will it stonewall, like the Post? As Latif himself might say, the jury is still out. The sad and disturbing facts are these: PR disinformation specialists like Marc Morano and complaisant columnists like Lorne Gunter are lying to us about climate science. Those lies are getting wide circulation through media outlets such as FoxNews and the National Post, and at their base are part of a clearly illegitimate campaign to influence politicians and the public, paid for by well-hidden fossil-fuel interests. Meanwhile, outside the contrarian echo chamber, there is an eerie and disturbing silence concerning those facts in the mainstream press. Why is that? And isn’t it time that changed? This entry was posted in Climate change "skeptics" and tagged Calgary Herald, Lorne Gunter, Marc Morano, Mojib Latif. Bookmark the permalink.